Best Goalie Mask Ever? Quite Possibly! 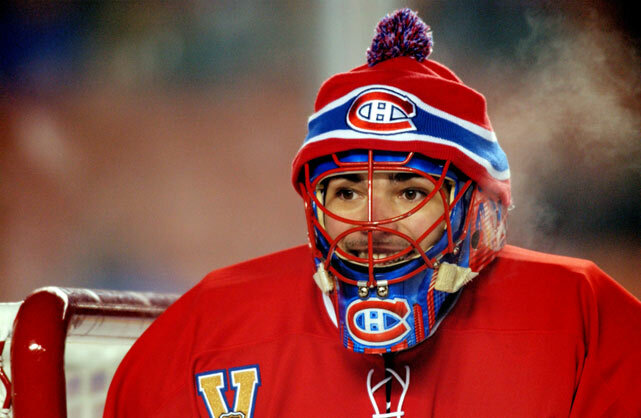 We all know how NHL goalies like to wear a toque over their masks during outdoor stadium games. I believe Canadiens netminder Jose Theodore was the first to do this, at the 2003 Heritage Classic. Now Canadiens prospect Michael McNiven has embraced that tradition with a new mask design that features a faux toque — a brilliant concept that was expertly executed by artist Sylvie Marsolais, who’s part of a Montreal design operation called Sylabrush. I love this! And check out the level of detail — Marsolais really captured the feel of the knitted yarn and the sewn-on team logo patch. First-rate job! There’s some background info and lots of additional photos here. The only down side here is that the toque concept can be duplicated for any team, so it’s easy to envision every goalie wanting his own version of this, which would water down the concept. If that ends up happening — and it seems somewhat inevitable, no? — I hope people remember that it all started with this mask for McNiven. Speaking of: McNiven currently plays for the Canadiens’ AHL affiliate, the Laval Rocket, so he presumably won’t be wearing this in a game anytime soon. But if he gets the call to play with the Habs, he’ll definitely be ready, at least in terms of his mask. Todd Radom print reminder: In case you missed it earlier this week, I’ve collaborated with uniform designer/scholar Todd Radom on a museum-quality art print that’s similar to the T-shirt design he recently did for us. It’s being produced in a limited edition of 150, with each print hand-numbered and signed by Todd and myself. And we’ve already sold through more than one-third of them, so move fast. The design is filled with lots of little Easter eggs that are of personal significance to Todd and me — full details here, or you can go straight to the ordering page. My thanks, as always, for your consideration. ’Skins Watch: Check this out! “It’s part of the Albert Stone collection of the Rochester Museum and Science Center,” says Doug Brei. 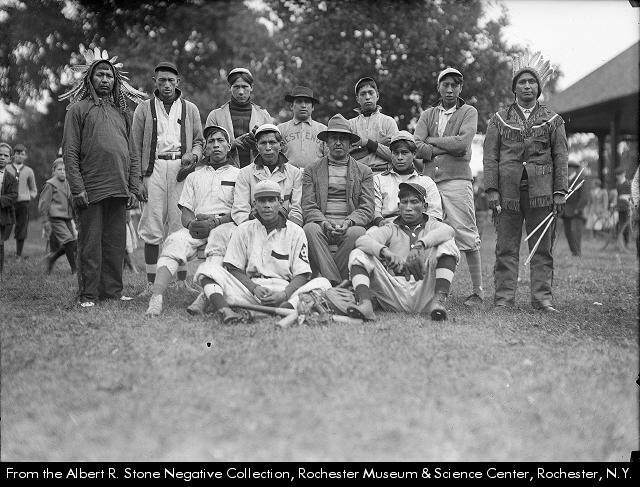 “The description lists it as a ‘Group portrait of Seneca Indian baseball team, posed in uniform with bats and mitts. To the left and right of the team are two Indians in traditional dress, one holding several arrows.’ The picture was taken sometime between 1911 and 1915. It’s one of my favorite baseball photos of all time.” … Chief Wahoo may be on the way out, but a new poll indicates that fans in northeastern Ohio still love him. Baseball News: Big news from “Game Worn Guides” author Bill Henderson: Up until now, his guides have only documented MLB uniforms as far back as 1970, but now he’s taking the plunge and doing pre-1970 guides. He could use everyone’s help with photo research. Full details here. … Nice little video clip of the NOB lettering and anniversary patch being sewn onto Royals C Salvador Perez’s jersey (from Blake Molina). … Here’s a good rundown of this year’s Orioles promo giveaways (from Andrew Cosentino). … Here’s a gallery of food being served at MLB ballparks this season (from Jonathan Bean). … Every MLB stadium has extended its protective netting this season. Here’s how it looks in Detroit (thanks, Kris). … Start ’em young: Chuck Betts’s six-year-old son, Easton, looks mighty sharp in his Little League uniform — complete with stirrups! … The Tigers may join the D-backs by bringing back the bullpen cart (from Jeffrey Sak). … The home and road bullpen designations at the Reds’ ballpark have been changed, and not for the first time (thanks, Alex). … I’m still calling them the Hens: Back in 1953, sportswriters in Louisville, Ky., refused to call the city’s then-new minor league by its actual name, which was the Glass Sox (fun find by Jerry Wolper). 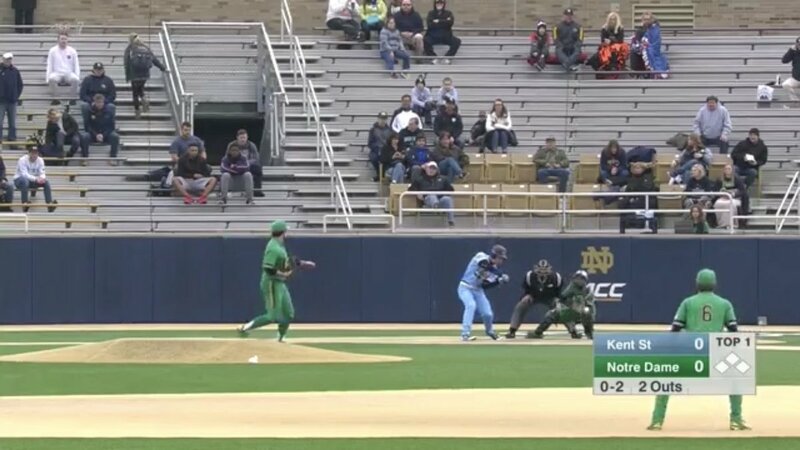 … Quite a game in South Bend, as Notre Dame and Kent State went mono-Kelly green vs. mono-powder blue (from Kevin Riley). 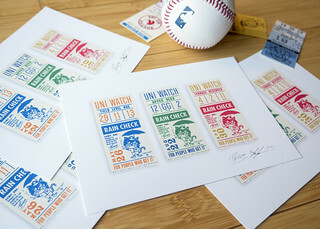 … Dennis Healy has produced a set of really nice MLB wallpaper designs. Feel free to use them on your computer. NFL News: A project to expand the Pro Football Hall of Fame has run into numerous problems (NYT link). … There’s some info on the Browns’ new uniforms, and on the team potentially retiring Joe Thomas’s No. 73, here (from Bob Moon). … Newly acquired Cowboys WR Allen Hurns will wear No. 17 to honor the 17 shooting victims in Parkland, Fla. (thanks, Alex). … With the NFL now formulating a rule that will make it a penalty for a player to lead with his head, at least one observer thinks football helmets are causing more problems than they solve (from Tracey Lynn). … Interesting article about the Bears’ newly revived orange alternate jerseys. Key passage: “The Bears are attempting to clarify with the NFL whether they are permitted to change their alternate jerseys on a yearly basis. ‘You can’t make decision changes within the five-year period,” [team chairman George] McCaskey said. ‘We’re trying to nail down whether we can have for instance an orange jersey one year, a throwback jersey the next year and an orange jersey the following year'” (from Tom Juettner). Hockey News: The Islanders’ old fisherman logo has been poached by a seafood company in Auckland, New Zealand (from Camryn Brown). … Sabres alumni held a wine-tasting event last night and wore a memorial patch for alums who’d died during the past year. 15 = Mike Bolland, 23 = Ken Britenbach, 29 = Jeff Parker, and it’s not clear who 31 was for (from @HaseksCage). Basketball News: The logo for the newly renamed Delaware Blue Coats looks a lot like the logo that graphic designer Skye Dillon created for the Paul Revere Project. … Back in 1991, a Seton Hall player dropped out after receiving threats in the wake of his refusal to wear an American flag patch on his uniform during the first Gulf War (good find by James Gilbert). … Here are this year’s McDonald’s All-American jerseys and sneakers. The jerseys have silhouettes of the players’ home states on the back (from Dave Garabedian). … Clever graphic by The Chicago Tribune, which depicted the Final Four as a thoroughbred horse race, complete with jockey and trainer references (from @Curley5). … USF’s jerseys are missing a period on the front (from @notthefakecasey). Soccer News: New home shirt for AIK (from Ed Zelaski). … Also from Ed: Cleveland SC has struck a uni-outfitting deal with Admiral Sports. … Newcastle United will not appeal a ruling against the team for putting betting advertisements on its under-18 jerseys. … The French Men’s National Team wore three different walk-out jackets to mimic the French flag. “Generally speaking, teams usually wear one walk-out jacket,” says Josh Hinton. … Also from Josh: Australia’s World Cup kit has leaked. Grab Bag: Virginia Tech is building a $10 million ACC Network studio on campus. “It is expected to be ready in time for the ACC Network launch in August of 2019,” says Andrew Cosentino. … The U. of Washington, which is currently outfitted by Nike, will have a new deal with either Nike or Adidas by mid-May (thanks, Brinke). … Here’s what Justin Thomas and Billy Horschel will be wearing at the Masters. … The apparel brand Fendi is relaunching its classic “FF” logo. … The Trademark Trial and Appeal Board has affirmed a refusal to grant a trademark for the name of the podcast Serial, because it is “too generic,” although it allowed trademarks for the podcast’s logos. … Dunkin’ Donuts is making running shoes with sprinkles. … At the bottom of this page is an interesting article about what it cost to keep UNC sports teams outfitted in 1979 (from James Gilbert). … The logo for a Target apparel brand called A New Day is causing confusion. … Budweiser packaging will now include a new logo indicating if the beer was brewed at a facility using renewable energy. … A designer has launched a new project to create mascots and logos for defunct teams. Should be good to watch this one unfold (from Aaron Wade). … Lots of fun facts about the Masters in this infographic. … Towson lacrosse will wear chrome helmets on April 7 to support pediatric cancer patients (from James Brandenburg). Today is Opening Day for Major League Baseball — one of my favorite days of the year. I’ll be watching the Mets/Cards game this afternoon, and of course I’ll be alert for any uni-notable stuff that pops up in the various season openers (including one tidbit that I’m already aware of but am not allowed to talk about). If you need a refresher course in all the new designs for this season, here’s my annual MLB Season Preview column. 93 comments to Best Goalie Mask Ever? Quite Possibly! What does a TV studio even vaguely have to do with uniforms? Give me a break. Has to do with visuals. But if a one-sentence item in the Ticker really ruined your morning, well, I hope the rest of your day is better. Can barely see it on the photo but I assume there’s a full tassel depicted on the top of the mask? That would the best part in my opinion. …and I see there is a link for additional photos but it didn’t work for me. That’s the Jacques Cartier Bridge on the bottom. Botto sounds like a character from Futurama. Botto was rejected by the Robot Mafia after getting into an altercation with Clamps, and had to take a job canning oil at MomCorp. Paul, could you clarify (in the Football sections of the ticker) what “You can’t make decision changes within the five year period” means? Is it a misquote, or am I missing some jargon here? That’s the direct quote from the piece. I agree it’s confusing. Seems like a misquote or an editing error. I assume they’re wondering if they could go back to a the Monsters of Midway throwbacks after one year if the orange jerseys aren’t successful. I’d love to get some clarity from McCaskey. Is he just paraphrasing the existing rule or is he coming out against the idea of the 5 year rule in general? I don’t think he’s coming out against anything, but rather asking for a clarification, or perhaps looking for a loophole. They can’t change their uniform plans twice in five years, but would that allow them to set up an alternating schedule with the orange uniforms as alts one year and the throwbacks the next. Love, love, LOVE the baseball wallpaper! Thank you, Dennis! Happy Opening Day, everyone. That ESPN article about the McDonald’s game has a tone more similar to an ad than a journalist. Is Adidas paying ESPN? I’m not quite picking up the same tone. Maybe it’s because the article’s using “Adidas” rather than the company’s preferred non-capitalized form. 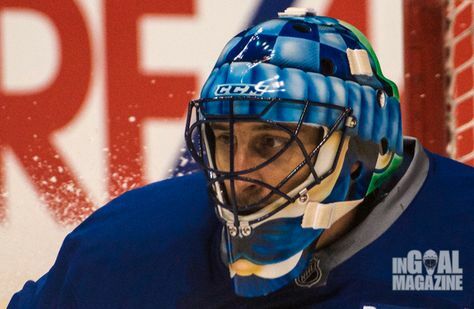 Roberto Luongo did have a toque painting on a mask when with the Canucks a number of seasons ago, though it was not as realistic looking as McNiven’s mask. His mask is supposed to make him look like Johnny Canuck. See the mustache on the front? Roberto wore it during November 2013 to promote the Movember cause. The toque looks cartoonish because it is emulating the Johnny Canuck logo. It looked cool from a distance. 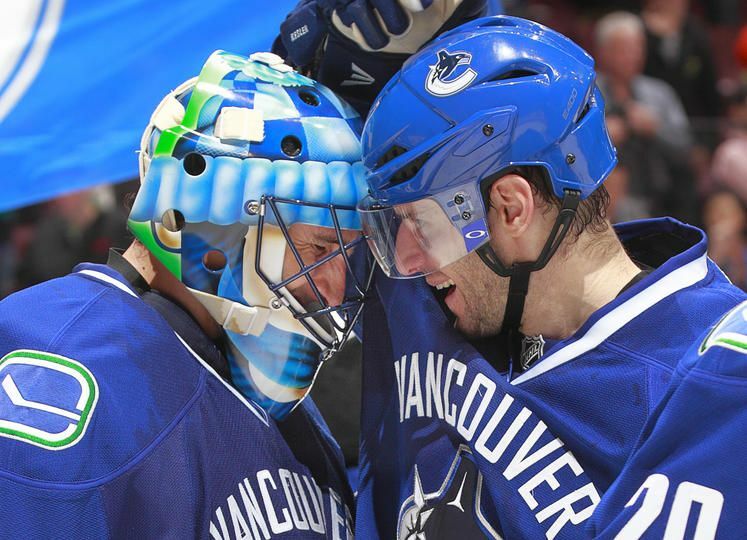 Looked like Johnny Canuck himself was in net. Oooh, that’s a good one! But I still think McNiven’s is the best. Could be duplicated by any team, turns out he stole the idea. Not quite as good as McNiven’s, but it does have a tassel painted on! 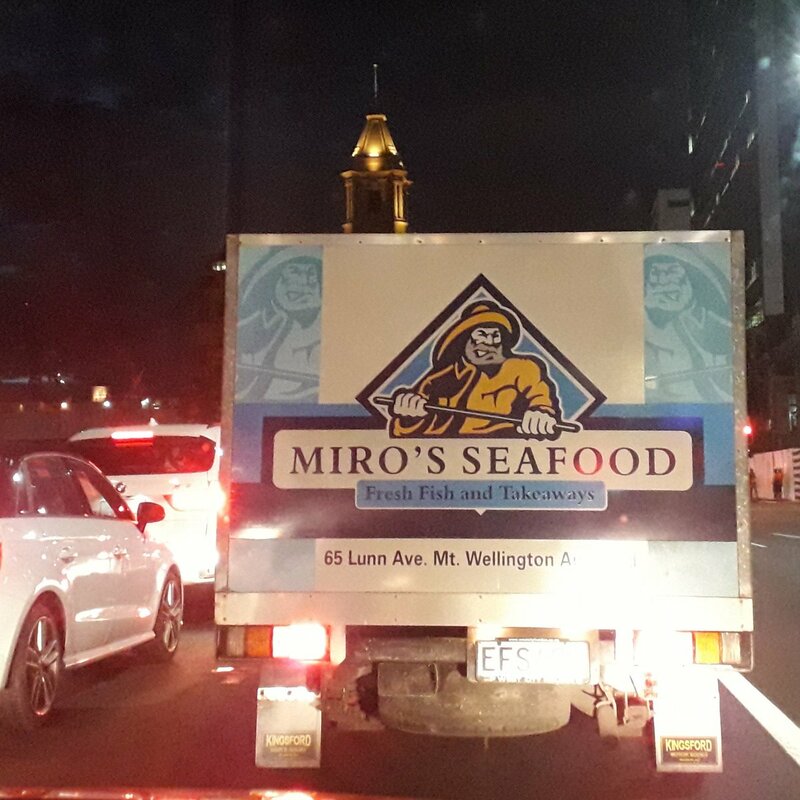 Funny that a seafood company is poaching a logo from a team who seemed to have poached it from a seafood company. Ah, the circle of life. Jason Voorhees had the best goalie mask ever. Also the NZ seafood company can keep the Isles old fish sticks logo. Are you going to be able to give us updates on Aaron Wade’s throwback project? Sounds cool. Happy Opening Day! I really like That mask. Was Charlie Brown’s smile Photoshopped? I remember the original Peanuts strip where Charlie Brown thought he was losing his mind after seeing the sun in the form of a baseball, complete with seams, whenever he woke up. Yes, a guy on twitter changed it. Shouldn’t the ticker item read “Saucony is making Dunkin’ Donuts running shoes with sprinkles”, instead of “Dunkin’ Donuts is making running shoes with sprinkles”? Blame the writer of the article’s headline. I think last night’s Clippers/Suns game deserves mention for how poorly the jerseys contrasted. Agree. I really like the color vs color, but only when there is lots of contrast. I’m a USC alum and love the USC/UCLA football game, but it used to be better when UCLA’s blue was lighter. This Suns/Clippers game would have worked if the Suns wore their orange uniforms. It’s been many years since I cared about that team, but I still find the inevitability of that seafood logo hilarious. The writer seems to be implying that the American Association’s Brewers were promoted to the NL to become the Braves, rather than the Braves simply being relocated from Boston. It’s made especially weirder when you consider that the relocated Brewers/”Glass Sox” were now the Braves’ affiliate! In 1952, the Mud Hens moved to Charleston. The Triple-A Brewers were owned by the parent Braves. So Milwaukee had experience getting a team during spring training before the Pilots moved there. Spotted on eBay: this 1980s Toledo jersey with nice big numbers on the back. Are they 10 inches tall? I miss these huge digits that you used to sometimes see. I remember seeing a photograph of the Seattle Pilots playing at Sicks Stadium back in 1969 having protective netting that the MLB has now mandated. Ahead of their time. I love baseball as much as the next guy but it’s MARCH! Spring training has become Winter training and baseball shouldn’t start until April. – Oh well, here we go… until November!!! Yeah, I’m not feeling it yet. I’ll be in more of a baseball mood next week. Opening Day should be on a Monday, not a Thursday. The “A New Day” Target logo isn’t good, but it’s not really confusing. Anyone who can read can figure out what is says in 2 seconds or less. On Opening Day, not Uni-related, but R.I.P. Rusty Staub. Chief Wahoo may be on the way out, but a new poll indicates that fans in northeastern Ohio still love him. Not a good poll because they only gave you the choice of Wahoo or the block C. Maybe if they included the crooked C or “None of the above” you’d get a clearer picture. For 30 years they’ve had stickers on the helmets saying they’re not to be used in this way. Why wasn’t it always a penalty?? Really stumped by that Sabres patch. No JW ever wore 31 or has passed on. Any Sabre fan out there have a guess? I went to the Sabres media guide, and came up with a possibility: Jim Weaver, a minor-league goalie from the 1970s who dressed as a backup for the Sabres in a handful of games in 1978, but never played. Only problem is, I can’t seem to find any other information about him besides this page. No luck finding an obit, an article, anything. Well, I decided to brazen it out and just ask the Sabres twitter feed about it. The Sabres did confirm it was for Weaver on Twitter (just not in reply to my inquiry, but to others’). McNiven’s mask is indeed one of the best ever. It belongs in the pantheon of great buckets with Gratton’s lion mask, Jake Allen’s blues make from last years winter classic, Bannerman’s Blackhawks Kabuki Mask, and more. It is really top notch details with how the toque on the mask looks real. Those masks you cited – all great ones. The late 1970s and early 1980s a great era for masks. I find many of the designs today too detailed, busy. The simpler paint jobs on the face hugging masks were more striking and effective. 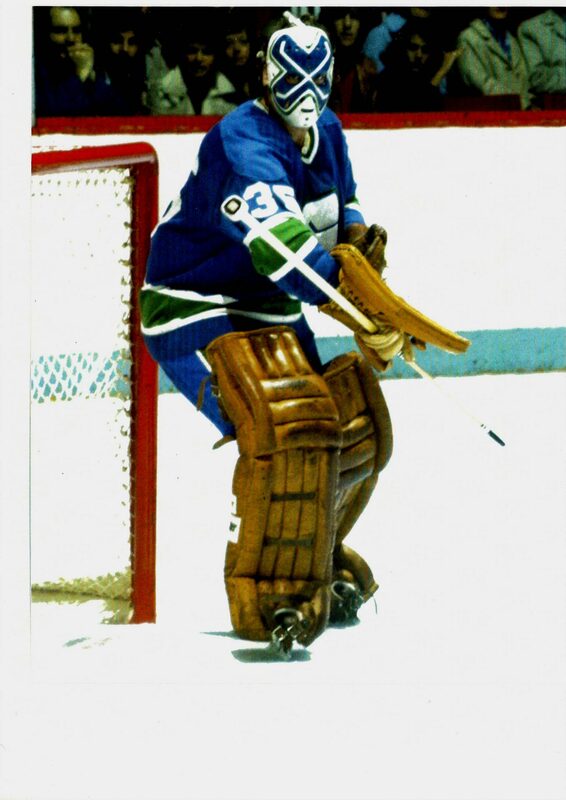 Again, you all will realize I will present this opinion with some bias as it is my favourite team, but the late 1970s Curt Ridley mask probably my fave. Agreed on the 70s and 80s being a great time for mask design. There are some great contemporary ones too, like Brian Elliot’s Flyers mask. That bucket is just so beautiful. Another great modern one is Cory Schnieder’s. If only his play would match the greatness of that mask. 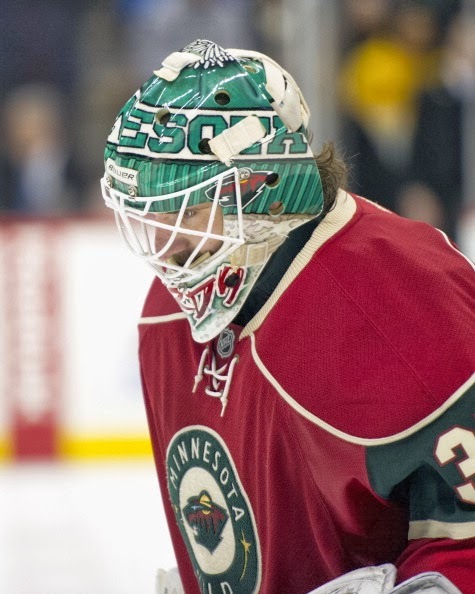 Of course there are some bad ones too, like Kieth Kinkaid’s Tasmanian Devil mask. Another bad one is Stephen King’s (I mean Alex Lyon’s) horror film of a mask. It is the reason I’ll avoid Flyers highlights as much as possible. Dennis, thanks for sharing the wallpapers. Thank you Jerry, i loved the pictures you took during the end of you career. One thing to look at in the CTE debate is the role of jerseys. With each successive year, Nike or Under Armor puts out another jersey designed to fit snugger or be harder to grad or hold. Sleeves disappeared as they were a holding risk. However, grabbing a jersey allowed a defender (or blocker) to slow an opponent down before wrapping up. Now, tackles and blocks are much more like true collisions. I also think the NFL should dramatically loosen holding rules. Linemen wind up with CTE because blocking still involves crashing other players. Let a lineman hold for a half second and blocking would be a lot less dangerous to the head. 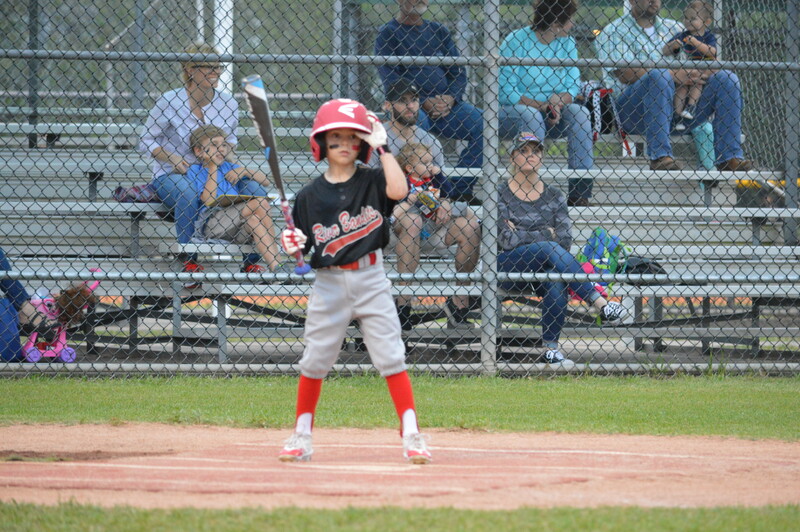 Thanks for Posting the pic of my boy in his LL uniform! He’s gonna super pumped when I show him after school today! Loved the Hockey mask and Baseball Preview!! Keep up the great work! Chuck, I did the same thing with my kiddo. The coaches remembered him because he was the kid in the stirrups. Today, he’s a senior in high school. Enjoy the ride! Change the name of Comerica Park to Bubblewrap Field. And what about the 29 other MLB ballparks, which have more or less identical setups? Well, it’ll make the rest of the corporate advertisers angry, but go ahead and rename all of ’em Bubblewrap Field. Equally dumb. If you’re sitting beyond the end of the dugout and the previously extended netting, keep your head up and watch the game. It’s been played for more than 130 years and previous generations of fans didn’t need to be saved from themselves 200 feet away from home plate. (Hope your eyes are okay; rolling them back into your skull can be dangerous, too.) -C.
According to this “logic,” there was never any need for players to start wearing batting helmets, because previous generations of players didn’t need them. And there was no reason to add airbags to cars, because previous generations of drivers didn’t need them. And so on. The same thing applies to virtually any safety improvement to, well, anything. Just because it didn’t exist before doesn’t mean everything was hunky-dory or that there was no room for improvement. I’m not advocating for or against the netting. But I’m definitely saying that you need to come up with a stronger argument for your position than you’ve done so far. People who have kept their heads up and watched the game were still getting pummeled with baseballs. Balls are flying off the bat faster than they ever have before. That’s what happens with better equipment and stronger players. If the game changes, the safety mechanisms in place for fans needs to change as well. Batters, drivers and passengers all are active participants dependent on improved safety. But fans are not actors; they are spectators who — unless they’re behind the plate or behind the dugout — sit far enough from the action that they should be able to heed the signs at the ballpark reminding them to pay attention. So get their heads out of their phones and pay attention to the action on the field. If they cannot do this as countless others through the years have done, then stay home and don’t put themselves at risk. You and Adam and others disagree, but I stand by my view and if that doesn’t meet someone else’s logic, then so be it. I’m not an academician. But I stand by my view. I’m not an academician either, and I fail to see what that has to do with it. fans are not actors; they are spectators who — unless they’re behind the plate or behind the dugout — sit far enough from the action that they should be able to heed the signs at the ballpark reminding them to pay attention. By invoking the term “bubblewrap,” you strongly implied scorn for anyone who needed to be protected. Now you’ve gone further and said fans should “get their heads out of their phones.” In other words, you’re not arguing your case based on objective standards of safety; you’re arguing it based on your personal scorn for certain behavior (or what you perceive to be certain behavior) by certain people. I don’t think that’s a particularly good framework for arguing for or against safety standards. Plenty of fans, including young children, have been hit by balls and bats without having been on the phone. And studies have shown that a foul ball can come at you so quickly that you can’t get out of the way *even if you’re paying close attention. * I’m sure someone who’s better at YouTube than I am can find the video I’m thinking of. Maybe you’ve even seen it. Personally, I don’t like the look of the netting, and I think it diminishes the open-air feel of a ballpark. But I also know that people have been hurt, and that I never sit in those lower-bowl seats, so I’m not the one who’d be at risk. So even though I don’t like the look, I’ve decided that the netting is probably for the greater good and that it would be selfish of me to oppose it. I’ve also noticed that the people who oppose the netting tend to make extremely poor arguments to support their positions. (I’m not referring to you.) I’m still waiting for the good arguments. Then let’s just be done with it all and put netting all around the park and above the spectators. If MLB and Manfred are really serious about safety, about reducing the risk of fans getting hurt to as close to zero as possible, then isn’t that the most ironclad, logical way to achieve such a percentage? Seriously, what would really be an argument why MLB shouldn’t implement such measures? -C.
Then let’s just be done with it all and put netting all around the park and above the spectators. If MLB and Manfred are really serious about safety, about reducing the risk of fans getting hurt to as close to zero as possible, then isn’t that the most ironclad, logical way to achieve such a percentage? Faulty premise. Nobody has said that it’s about getting the risk “as close to zero as possible.” It’s about mitigating risk when possible. Moreover, I have yet to hear of anyone in the middle or upper decks being hurt by a ball or bat. Have you? So you’ve proposed a hypothetical solution for a non-problem. But I’m aware of plenty of instances of people at field level being hurt. That’s a *real* problem. And now they’ve come up with a real solution. You can like it or not like it, but it would be helpful to argue the case on the merits, not on hyperbole. I guess the same people arguing against more netting would say the glass should be taken down at hockey games. Cmon, looking through the netting is no worse than that. If you want crystal clear, stay home and watch it on tv. and so tyrus cobb sayith to yinz, hons, jags, gumbas, dudettes, and lil angels of joy who are the apples of eyes…brah, keep your head-up or i will smite thee with thine hide held on high on a traight 100 mile an hour line at random if you are eating nachos, on the mobile tele, or completely engaged in my balls. happy holiest of holy days brown bag and skip, summer is almost here. i honestly didn’t even know today was the day, i’m a lost saddle soap of leathers and pined lumber, pray for my spot bilt rubber sole for my straying. Ah, so good to hear from you, Comrade. Was thinking of you on this holiest of holies! Good thing I didn’t share it — turns out not to have happened after all! I’m still inclined to think Brian Hayward’s original shark head mask is the best ever. The first one airbrushed by Don Strauss of Armadilla masks. I would disagree. It had a good idea but the execution was poor. Also, didn’t Martin Jones or someone else copy it and it worked much better? Never mind, I was thinking of a different mask. That shark head bucket was pretty good.